A talented musician is proving disability is no barrier as he prepares to play a key role in Brandon Trust’s Christmas carol service on 8 December at Saint Stephen’s Church in Bristol. Will Lake, 31, of Doynton, South Gloucestershire, has moderate learning disabilities and a hearing impairment. 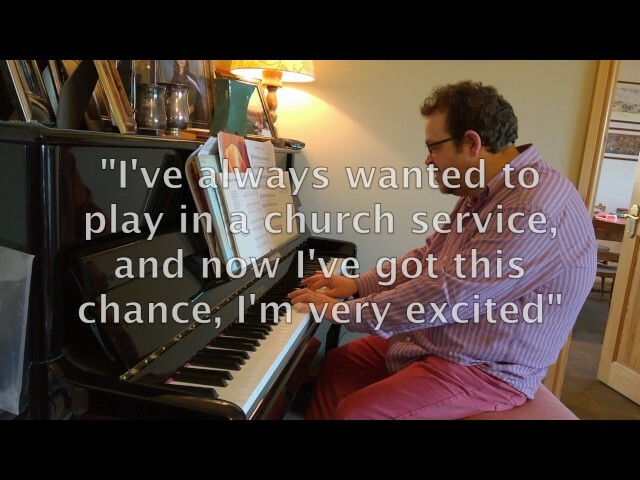 He is supported by Brandon Trust and will play the organ during the service, fulfilling an ambition he’s had since first playing music as a very young child with his grandad. Will, who also sings in a choir, said: "I love being a musician. I’ve always wanted to play in a church service and now I’ve got this chance I’m very excited, and a little nervous. It’s really special for me and something I’ll remember forever." It is very much a natural talent. Will learnt to play music by sitting on the organ stool alongside his grandad, who played the organ in their local church and taught him how to find notes and cords. He will be accompanied by his mum Catherine, a music teacher, who said: “He hasn’t stopped talking about it. It’s his fantasy to play in a church service. Will loves music and was born with a gift to play by ear. He also plays the drums and accordion." As well as his musical ability, Will has a placement at Brandon Trust’s ceramics studio Fired Up, in Yate, plus has a paid role at their social enterprise, called Enterprise, which supplies hospitals with organ donation retrieval packs – put together by the charity’s supported employees. The carol service starts at 6.30pm at the city centre church and is open to everyone. After the service, mulled wine and mince pies will be served. The event will also highlight the partnership between Saint Stephen’s Church and Brandon Trust, who run the church’s café as a social enterprise. It currently provides supported employment and training for eight people with learning disabilities and delivers an extensive daily menu to customers. Brandon Trust Social Enterprise Locality Manager Jo Cullum said: "This is Will’s dream and he talks about it all the time. This service is open to everyone and we want to fill the church. It is about inclusion and a celebration for everyone." Revd Lee Barnes, Vicar of The Community of Saint Stephen's, added: "Will's story wonderfully exemplifies the fantastic work that Brandon Trust is involved with to enable all people to live free."